Sick tricks: Basic skating techniques for your Vuly Deck. ‘Safety’ can be a bit of a dirty word for young, adventurous kids. Has one of yours ever wanted a skateboard, but you’ve said no because you were worried about them hurting themselves? 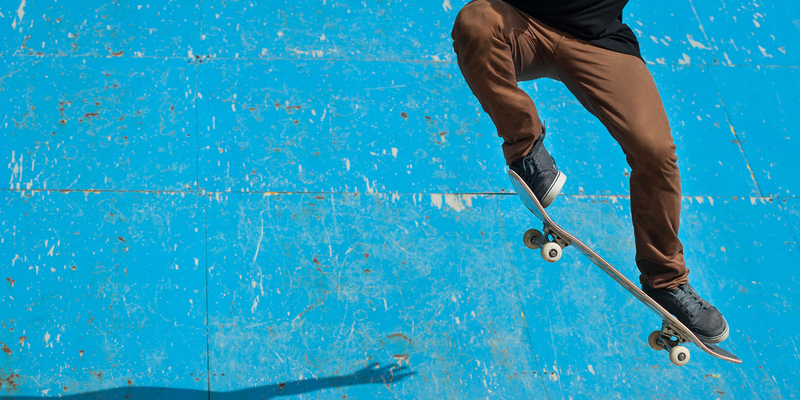 Grazed knees, or more serious head injuries, can happen when children try out skateboarding tricks without having properly learnt them first. With a Vuly Deck, kids can learn the most fearless techniques in the safety of your Vuly’s ‘Goldilocks’ enclosure system and bouncy mat before they head out to the skate park. What tricks can they do with a Deck? Almost any flips and kicks! Here are our top 4 beginner Vuly Deck tricks for your kids to practise. Remember: Some of these moves may be slightly more difficult without forward momentum. Ollies are perhaps the most fundamental moves that one can perform on a skateboard or Vuly Deck, and it’s essential to master because it forms the foundation of many other manoeuvres—like the kickflip and heelflip—which we’ll look at in later articles. Position your front foot near the middle of the board, and your back foot on the tail. Make sure that the ball of your back foot is hanging off the side of the board. Stand in a crouching position. Try not to bend your back, or stick out your behind, too much. Lift your front foot first, and then push down your back foot to launch both yourself and the board into the air, as well as tip the front of your board upwards. Think of when you stamp down on the end of a board to make the other end flip up so that you can grab it—it’s the same principle. Pull in your front foot immediately, parallel to the angle of the board. Pull your knees up towards your chest. Level out the board with your feet at the height of the jump, and push the board evenly back towards the mat. Try to land completely horizontally! Performing a manual may look simple, but doing so requires more balance than it appears. Learning to manual is essential because it builds confidence in your footing and helps you learn how to remain stable—both of which will be crucial when you progress to actually moving on the ground. Position your front foot towards the front of the board, and your back foot covering most of the ‘curved’ section of the tail. Bend your knees, and shift your weight to the back of the board, while leaning forwards until the front lifts off the mat. Don’t lean back, even though it feels like you should! Keep your balance, without letting the tail of your board touch the mat. Push back down with your back foot until the entire board is once again on the mat. Learning how to interact with your board—including with your hands—during tricks is very important. Your board isn’t just there to jump and land on; often, tricks call for you to actually adjust your board’s positioning. The caveman is almost like an introduction to these moves, because it requires to to jump first, and then place your board with your hands. Hold the nose of your board to your side with your main hand. Jump as high as you can into the air. Tuck in your legs at the peak of your bounce, and place the board underneath your front foot with your main hand. 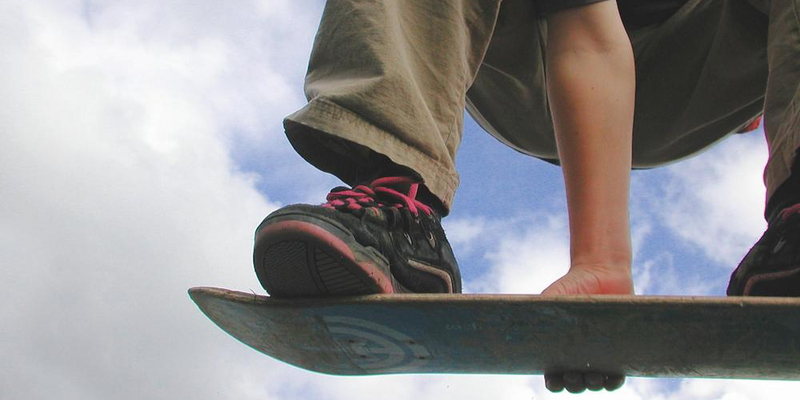 Place your back foot onto the board, and try to land horizontally. The shove-it is an old-school move that looks smooth, and feels satisfying when you pull it off. The more popular (and complex) variation, the ‘pop shove-it’, requires you to use your ollie-ing skills, but a basic shove-it is just a 180? board spin without the tail of the board slapping the mat. Position your front foot towards the front of the board, and your back foot covering most of the ‘curved’ section of the tail (like a manual). Perform a short hop, and with the heel of your back foot, kick the tail of the board hard enough that the entire board flips around 180?. Land on the rotated board. Many tricks, like the kickflip are incredibly popular. However, most aren’t really beginner’s moves. Watch as your child practices the basic techniques that we’ve talked about, and by the time they have mastered them, we’ll have a second article on more advanced tricks to learn with your Vuly Deck. Let us know how your kids fare!